It’s been a six-month fitness transformation for WBIR 10News reporter Becca Habegger. WBIR has been partnering with Citview Magazine over the past half-year in a project called Transformation Knoxville. Cityview’s publisher and owner Nathan Sparks and WBIR 10News reporter Becca Habegger have been making some major life changes. This is one of their “before” pictures, taken in early February. They’ve been working with Michelle and Scott Williams, of Totality Living Well. The Williams appear monthly on 10News at Noon, preparing healthy dishes. Becca says she has dramatically altered her lifestyle in healthy ways. This includes eating “clean,” meaning she has cut out from her diet artificial sugar, cut down on carbs and fat and added more fresh vegetables and lean protein into her diet. She is also working out several times a week, through a mix of lifting weights and cardio sessions. 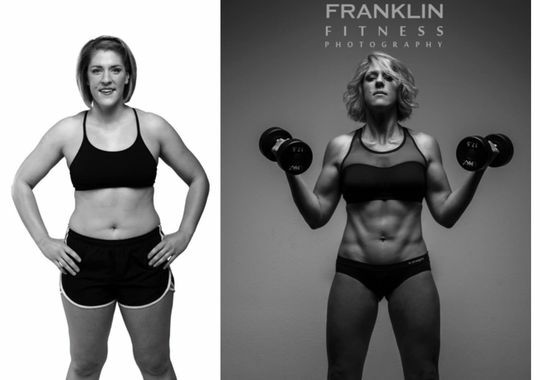 To commemorate the six-month mark and the progress Becca has made, she and Totality Living Well teamed up with Bob Franklin, of Franklin Fitness Photography, and Jeanine Raby of Salon Aurora in a photo shoot Saturday at Maxed Out Gym in Oak Ridge. There, Franklin took photos of Becca working out and posing in positions that highlighted the muscle she has built. Michelle Williams said she often sees people who want to see results after one month or even a couple of weeks– and usually that goal involves only a number on the scale. Many people want to crash diet before a reunion or a wedding, she said, but then the weight comes right back because they didn’t make positive, sustainable lifestyle changes. Read more about Transformation Knoxville in the latest issue of Cityview Magazine, available now online and in stores.